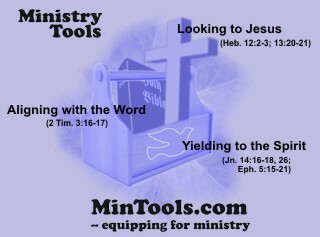 Ministry equipping requires more than books, online training and other ministry resources & tools. Focus on our ultimate resource, God Himself and His Word. Whether in an official position of ministry or during the course of our everyday living as salt and light in this world, we need God’s power to be effective. We must pull on His strength and sustenance, always remembering Jesus’ words in John 15:5. He said, “I am the vine; you are the branches. If you remain in me and I in you, you will bear much fruit; apart from me you can do nothing. When we consider the following truths about God’s power, it seems rather foolish to rely on our own strength and abilities. As we serve we’ll be faced with temptations, weaknesses, and spiritual battles. We may want to give up or compromise. The following verses show us that we can rise above whatever comes our way when we rely on the right Source of power. The following verses show the strength, confidence, and grace we can find when we rely on God’s power to teach, preach, witness, or serve in any other capacity. When we acknowledge God as the Source of ministry empowerment, finding His power to not only be sufficient but even exceed our needs and expectations, how can we not issue forth in praise and honor to Him? We’ve already established that to do ministry God’s way, we need His power. We need to cease striving to do ministry in our own strength. When we do, we’ll see the power of God unleashed in ways that are “immeasurably more than all we ask or imagine, according to his power that is at work within us” (Eph. 3:20). The issue is not “if” we have this power available to us but how to pull on that power. God’s provides a variety of means for ministry empowerment that we can pull on. The Resurrection Does All That?? What Does the Cross Plus the Resurrection Equal? If we’re going to do ministry effectively, we need to do it God’s way and we need His empowerment, using His wisdom, grace, and power. 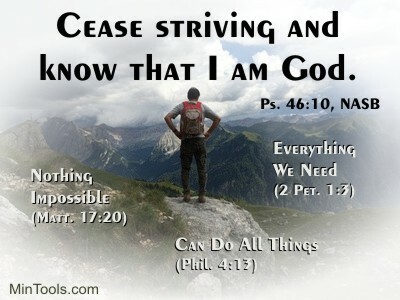 We need to cease striving on our own and know that He is God (Ps. 46:10). Jesus clearly stated that apart from Him, we can do nothing of eternal value (Jn. 15:5). When we rely on Him, nothing is impossible (Matt. 17:20; Phil. 4:13). His divine power gives us everything we need (2 Pet. 1:3). We’re finite, meaning we’re limited in what we can understand and do. To accomplish that which counts for eternity, we need wisdom and power outside of ourselves, that which is higher and greater than ourselves — divine power. We’re fearful, lacking the confidence needed to persevere spiritual battles and challenges that can come in ministry. To keep going, we need to get beyond our own insecurities by putting our confidence in Someone stronger than ourselves and greater that all spiritual forces. We tend to flounder, not knowing what direction to take. To consistently maintain proper priorities and not get sidetracked in ministry, we need help from Someone capable of seeing the big picture. We fall short, never able to perfectly meet the standards of a Holy God, even when we give our best. To truly make a difference, despite our weaknesses, we need His grace to bridge the gap, to do what we cannot do. For more about God’s power in ministry, click on the related posts below. Serving God’s way means we align with Him, use His means, and do it for His glory. God provides the power and equipping resources to effectively serve Him through His Word, His Son, and His Spirit. When we look to God as both our Source and Sustenance in ministry, we accomplish all we do under God’s leading and power rather than leaning on our own understanding and efforts. Click on links below that address different aspects of ministry in ways that make serving about God and what He does. The Ministry Worker’s Devotional: A Mighty Fortress Is Our God likens the individual attributes of God to rocks upon which we can stand. Put all those rocks together and we have a mighty fortress in our God! With all we have coming against us in ministry, it only makes sense, then, that we study the character of God. A base from which to make wise decisions. There is so much to do and so little time to do it in. What should be priority? From all the good choices, which is best? A standard to keep you on course. In ministry it is so easy to hop on the bandwagon of current ministry trends or fads. The broad way is not always the right way for you (Matt. 7:13-14; Prov. 14:12). A compass for morality. Just because you are in Christian ministry doesn’t mean you will avoid temptations. The lure to follow the ways of the world is great. The pull of the flesh can be strong. The tendencies to boast won’t let go. A means to a life worth living. Sometimes ministry brings little earthly reward or applause. When you fear the Lord, you can rise above and find meaning, contentment, and satisfaction nonetheless. A bolster to confident living. Security breeds confidence. If you rest in the power and protection of the Lord, you can firmly stand and move out with competence knowing He will be there for you. He is your sufficiency. A path to intimacy with God. Do you want to know God’s ways? Do you want to know His will? Get to know His heart. Get to know His character. Get to know who He is. Check out the Ministry Workers Devotional for how specific character traits of God relate to serving. Everybody seems to like freebies … especially when they truly are free with no strings attached. For something to truly be free means that it comes without a cost to you … a gift. I see many searches in the web site statistics for free resources. And, so many people have made requests through the contact form for free material that after much prayer a decision was made that those kinds of requests would no longer receive a response. Despite that policy being stated on the contact form, requests for free material (and free money) still come in regularly. Let’s remember that even the greatest free gift ever … eternal life in Christ Jesus (Jn. 1:12-13; Rom. 6:23; Eph. 2:8-9) … was not free. It cost Jesus His life! For Ministry Tools Resource Center, providing freebies could mean the loss of a sale which translates into less money for the ministry. It costs time initially to put all this material together to provide it freely to the Body of Christ as well as money to keep it up. An online ministry incurs costs which is why everything we offer can’t be free, as much as I truly would love to make everything a freebie.